show what’s possible for women building socialist workers’ states. Women have risen up to oppose the reactionary Trump administration and to assert our rights. The outpouring of millions of women at the Women’s March, not just in the U.S but globally, on January 20, 2017, the day after his inauguration, signaled a new era. Now #MeToo and Time’s Up are leading the way, as women fight for justice and equality, in all areas of life, but especially in our personal lives— for bodily integrity and self-respect. 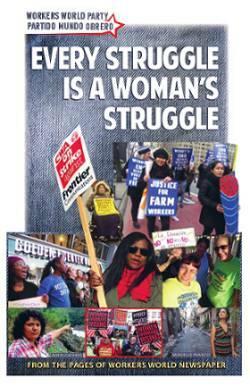 This pamphlet, a compilation of articles from the pages of Workers World newspaper from late 2016 to Women’s History Month 2018, reflects those many struggles. Struggle is the only way to bring about change, especially the thorough-going, multidimensional change that’s needed to bring about women’s liberation. Those leading the struggle for change include the activists fighting racist police violence, against sexual abuse, for living wages led by Fight for $15 and a union, for DACA and stopping deportations and raids, for a clean environment and the youth uniting coast-to-coast around the demand for safe schools and much more. The many articles selected for this pamplet show the wide range of struggles that women in the U.S. are actively involved in— against racism and white supremacy; for the right to quality, comprehensive health care and control of our own bodies; for ending the pay gap and for union representation; and for recogition of transgender people’s rights. Articles on women in the Democratic Republic of Korea and Cuba show what’s possible for women building socialist workers’ states. Because these articles originated in Workers World, the newspaper of Workers World Party, they reflect a Marxist perspective about the role of women in society. Women are seen as a vital, integral component in the overarching struggle to end capitalism and classism. The basis of women’s oppression and inequality is rooted in patriarchy, which arose at the same time as classes developed, with rich owners lording their wealth over those without property. Today’s struggle for women’s liberation is essential to overthrowing patriarchial capitalist class society and establishing egalitarian socialism. Some in the progressive movement, in the name of condemning capitalism, assert that so-called “identity politics” have no place in the struggle to end class oppression and exploitation. But all people must understand why patriarchy should be dismantled and obliterated, at the same time that all people must unite against racism and LGBTQ bigotry so that all forms of class oppression can be smashed and dumped into the wastebin of history. As Monica Morehead stated in a talk at an International Working Women’s Day meeting in Boston on March 17: “WWP holds the view that all oppressed nationalities and workers will eventually win their empancipation through socialism — no matter what road they decide to take to get there, up to and including separation. But if we want to win our class to this view about socialism, we undertand that this is a process that will only be achieved by building genuine solidarity within our class— the working class — through patience and perserverance. Working-class unity, based on solidarity, is needed for victory against the bosses and bankers who run the capitalist world and pull the strings of politicians and media moguls. Soldiarity is the glue that binds together the many separate struggles fighting against capitalist rule. It is our most potent weapon in forging a better world. This compliation of articles exploring the breadth and depth of women’s oppression is intended to hasten and inspire the struggle of women and of the overall class struggle. 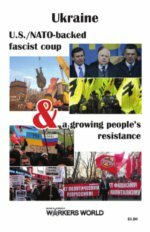 May it be a resource, a guide for and a contribution to that united struggle.